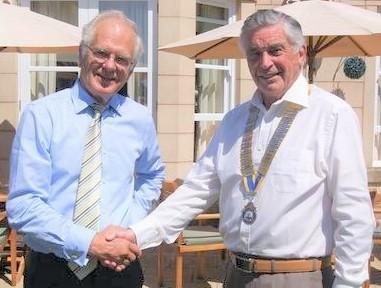 IN handing over to his successor the club insignia with his best wishes, Dunfermline Rotary Club’s outgoing president David Lyth reflected on a year in which a stable and predominantly active membership had delivered £13,000 for good causes and secured the leadership succession over the next three years. President David congratulated his council for their hard work and forbearance during “the usual learning curve” of his first months in office. He looked back on a crowded year of fund-raising activities and projects which had also seen the club acquire a new projector and club banners and make a significant contribution to Rotary International’s global campaign to end polio…a cause close to his heart after his own five-year medical mission in Africa. He encouraged members to use the recently improved communications to promote closer engagement with District 1010. President David, he said, had rallied through the year without a vice-president but with the support of an “outstanding council” He had also worked hard to confound the sceptics and raise the funding required to complete the Burumbika Health Centre in the Mountains of the Moon in Uganda, where he and his teacher wife, Helen, had spent three years during their five-year post-retirement mission to work among the poorest people in Africa.